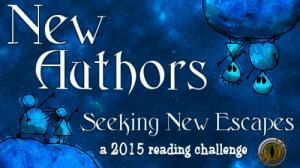 This is my sixth year taking part in the New Author Challenge hosted by Literary Escapism. As much as I have many favourite authors on my auto buy list I still love to discover new authors. This is also great to discover both brand new and well known authors that I haven't got around to trying yet. Last year I changed my focus from trying lots of new authors to trying to finish up some of the many, many series that I've already started. I really enjoyed catching up with books by some of my favourite authors so I'm going to do the same again this year. I do still love discovering new authors though so I'll keep my goal at 50 new (to me) authors in 2015.